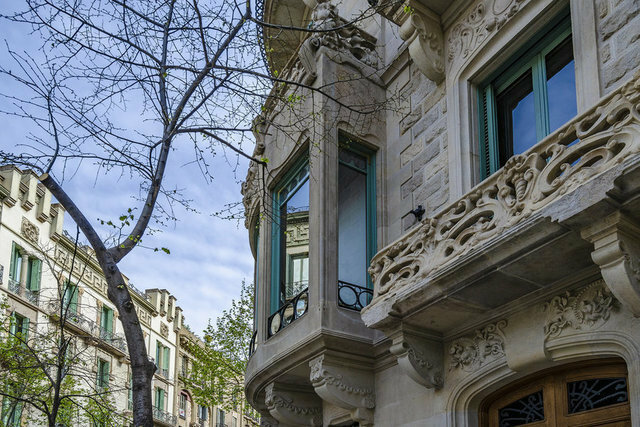 Extraordinary renovated apartment of 127m2 built on the renowned modernist estate Casa Burés (masterpiece of Francesc Berenguer i Mestres, collaborator of Antoni Gaudí, which was built between 1900 and 1905 by order of the textile industrialist Francesc Burés i Borràs). Its lobby leaves nobody indifferent, since it maintains, among other elements, the small capitals with representations of animals, the life-size sculpture of a brown bear hugging a lamp and the skylight with colored stained glass. Maintaining the original elements and adding comfort and high quality materials has been the challenge for the developers of this unique project in the city of Barcelona. This type of apartment is structured in a central corridor that functions as a spinal column, where at the end there is an open space and then the living room with an open kitchen of 44m2 and access to the terrace. In addition, there is the master bedroom suite, with wardrobe area and access to the terrace. Two rooms (one of them double and the other single), wardrobe area and a full bathroom complete the property. The services of the community for the owners and their guests are exceptional and include swimming pools, gym, spa area, cellar, terraces and living room with kitchen to organize social gatherings.